Ethiopia, where 20 per cent of the people are in urgent need of food aid, defended its plan to offer 2.7 million hectares (ha) cultivable land to foreign companies. "It's not land grabbing. It's better than begging," said Esayas Kebede, director of Agricultural Investment Support Office. We have abundant land and labour. Foreign commercial farming will help us end poverty and hunger, he said. Till now, 2,000 companies, mostly Asian, have secured land in Ethiopia--known for its coffee and sesame. India leads the race. The government is also considering a new land use policy to lure foreign companies. 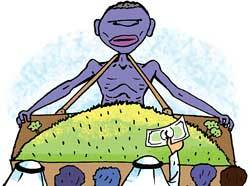 The head of UN's Food and Agriculture Organisation, Jacques Diouf, had recently warned against the rush by giant economies to acquire land in poor countries to feed their own people. He called it neo-colonialism. The Aral Sea, once the world's fourth largest lake, has been reduced to a tenth of its former size. Space images from the European Space Agency showed the lake dramatically retreated from 2006 through 2009; its eastern section lost about 80 per cent of water. Straddling Uzbekistan and Kazakhstan, the Aral Sea now has 6,070 ha of salty and toxin-laden lake bed. Experts blamed this disintegration largely on the former Soviet Union, which in the 1960s diverted two major rivers feeding the lake. The lake would disappear by 2020, they said. The world's ocean surface temperature was the warmest on record for July, breaking the previous record set in 1998, said the US National Oceanic and Atmospheric Administration. At 16.99C, ocean temperatures were 0.59C above the 20th century average. The average land and ocean surface temperature for the month was 16.37C, the fifth-warmest since record keeping began in 1880. A study by China's policy advisors signalled a flexibility in its stance on international climate change negotiations. The 900-page 2050 China Energy and CO 2 Emissions Report calls for quantified targets so that the country's emissions will slow by 2020 and begin to fall by 2030 without affecting economic growth. The report acknowledges that China has surpassed the US as the world's largest emitter of greenhouse gases and suggests the government investing 1 trillion yuan in low-carbon technologies each year until 2050. The panel, which said climate change is a matter of urgency, stressed the report was a research exercise. However, it is significant as it is the first time a government document discussed emissions targets. Till now China's stance has been that it is a developing nation and will not consider emissions reduction target. US officials have criticized a UK decision to lend money to European aircraft manufacturer, Airbus, just weeks ahead of a World Trade Organisation (wto) ruling on aircraft subsidies. The statement came soon after the UK unveiled a 396 million (US $565 million) loan to help Airbus build wings for its new A350 model--a medium-sized, long-range craft. It is scheduled to start flying in 2013 and will compete with Boeing's 787 Dreamliner and 777 planes. The US and the EU in 1992 signed an agreement on trade in large civil aircraft, which permits either side to lend up to a third of the development costs for new planes. But the two have been locked in a legal battle at the wto for the past five years. The US accused EU of giving US $200 billion in illegal aid to Airbus, while EU said the US has favoured Boeing with US $24 billion in subsidies. To keep ahead of the progress of GM (genetically modified) technology, the EU published norms for the commercial cultivation of plants modified to produce drugs, even before it becomes reality. The norms by European Food Safety Authority describe how developers of gm plants, grown for purposes other than human or animal consumption such as producing pharmaceuticals, will need to assess the potential risks to humans, animals and the environment. Both the European Commission and member countries will decide whether or not to grant permission. 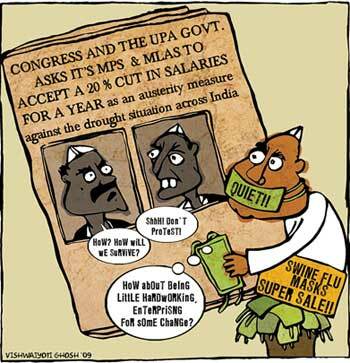 At present, scientists seek a nod from member countries alone for GM food crop trials. Following decades of exploitation, Kenya is taking drastic measures to save its water resources. The government has unveiled plans to reforest the degraded Mau forest, the country's largest catchment area, and plant another 7.6 billion trees across the country over 20 years. Just 3 per cent of the country is covered by forest. The government has also issued warnings to city dwellers not to use electrtic boosters on water pumps. 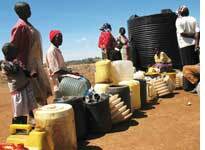 The water crisis is at its worst in the capital Nairobi, where some have gone without water for a month. Venezuela is looking for trading partners to ensure food supplies, after President Hugo Chavez cut off trade links with neighbouring Colombia. Chavez, a fierce Washington critic, is furious with Colombia for hosting US troops at its military base to fight drug trafficking. Colombia has long been a major supplier of food to the oil-rich Venezuela that depends on imports for two-thirds of its food needs. Within days of halting the import, Chavez signed over a billion-dollar trade deal with Argentina for meat and rice. It also bought 1,500 tonnes of coffee beans from Brazil. But analysts say this is not sufficient Argentina, for instance, will supply 80,000 tonnes of beef a year whereas Venezuela consumes 600,000 tonnes. Moreover, Argentine traders have driven hard bargains and wrangled concessions on excise duties. The government has already passed the expenses on to its citizens. Soon after signing trade deals with Argentina in the last week of July, the government increased the prices of food. Canada launched a series of military exercises in its Arctic region to show a visible presence in the area, amid claims among other Arctic countries. To demonstrate his country's determination to assert sovereignty claims, Prime Minister Stephen Harper also joined the military exercise. He launched the Canadian Northern Economic Development Agency and said "We know the gaze of other nations is increasingly focused here, in our Arctic. By working to reach this region's full economic potential, we are strengthening its people as well as the sovereignty of our country." Five countries bordering the Arctic-Canada, Denmark, Norway, Russia and the US-claim overlapping parts of the region, which is estimated to hold 90 billion untapped barrels of oil. Tasman booby, a large sea bird believed to have become exinct in the late 18th century, has been rediscovered. A group of researchers from New Zealand and Australia said the bird is actually a subspecies of a living bird, masked booby, found on islands in tropical oceans. 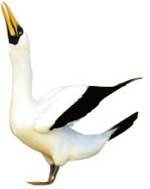 The researchers had long suspected that Tasman booby is related to the masked booby, as they have similar male-female body shapes. Recently they compared fossilized and modern bones and dna from specimens identified as Tasman and masked boobies and found they were similar. The confusion had come about because fossilists had compared bones of female tasman boobies to those of male masked boobies, unaware that females are bigger in size, and assumed they were looking at two species.